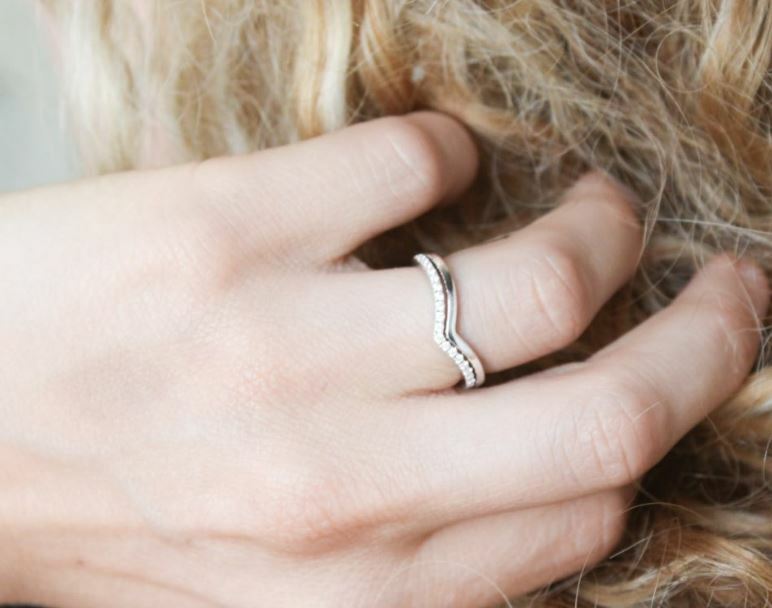 Stacking rings is one trend we hope never fades! 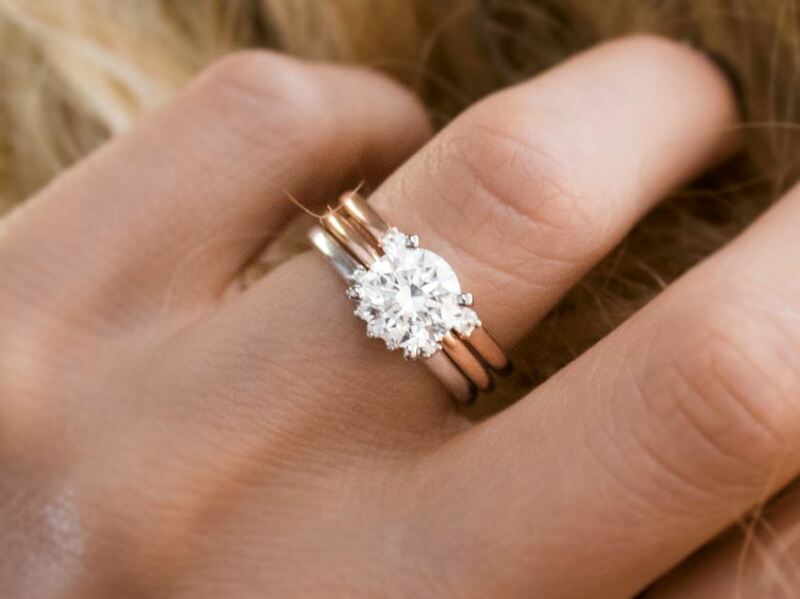 Tips to Create the Perfect Ring Stack! Stacking rings is one trend we hope never fades! 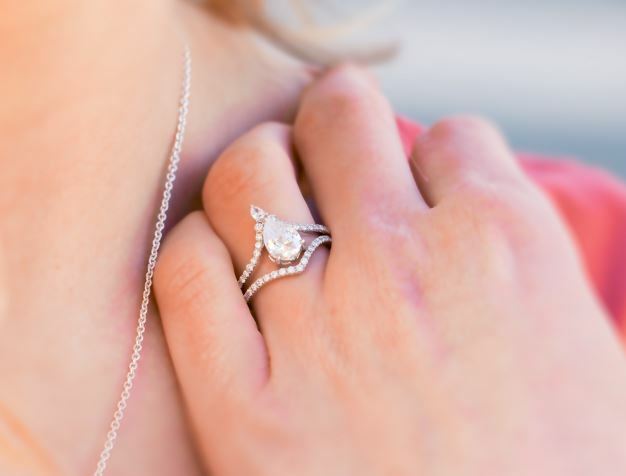 Whether you’re accessorizing your right hand, or adding on rings to your bridal set, a well-curated stack has the ability to make a stunning statement. 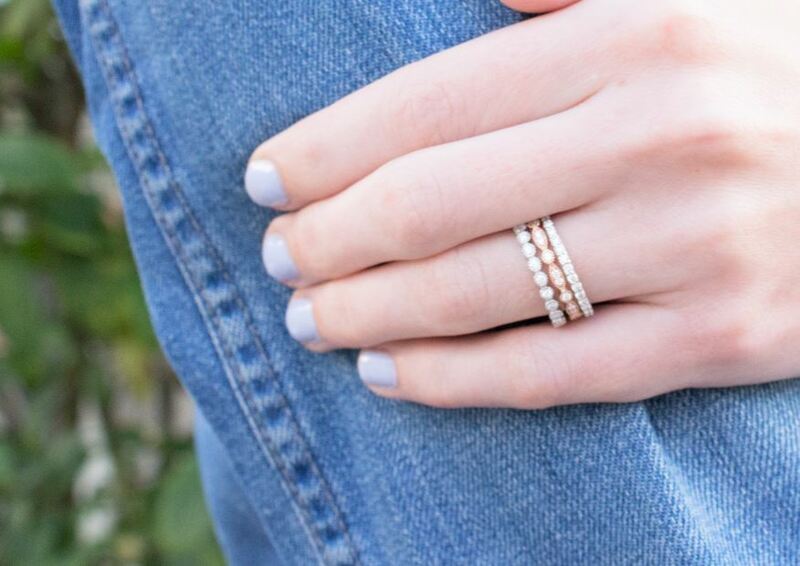 We’ve rounded up some ring stack inspiration, complete with tips on how to recreate the look! You’ll be stacking like a pro before you know it. 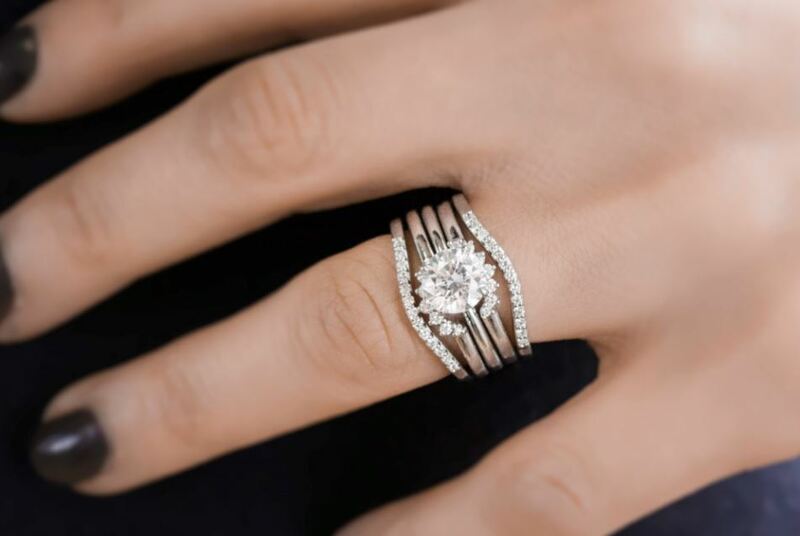 Adding a mix of contoured bands around your engagement ring creates a unique and versatile “nested” look. Choose bands that mimic the shape of your engagement ring for a streamlined appearance. Selecting rings with diamond or gemstone accents is a great way to add sparkle to a solitaire. 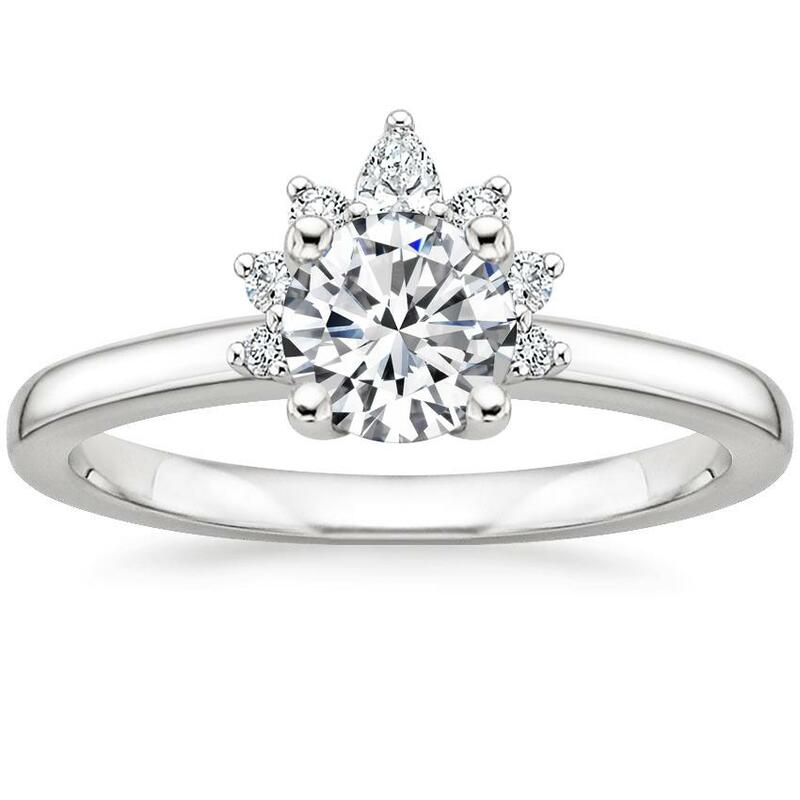 This elegant solitaire features an open basket with claw prongs that cradle the center gem. 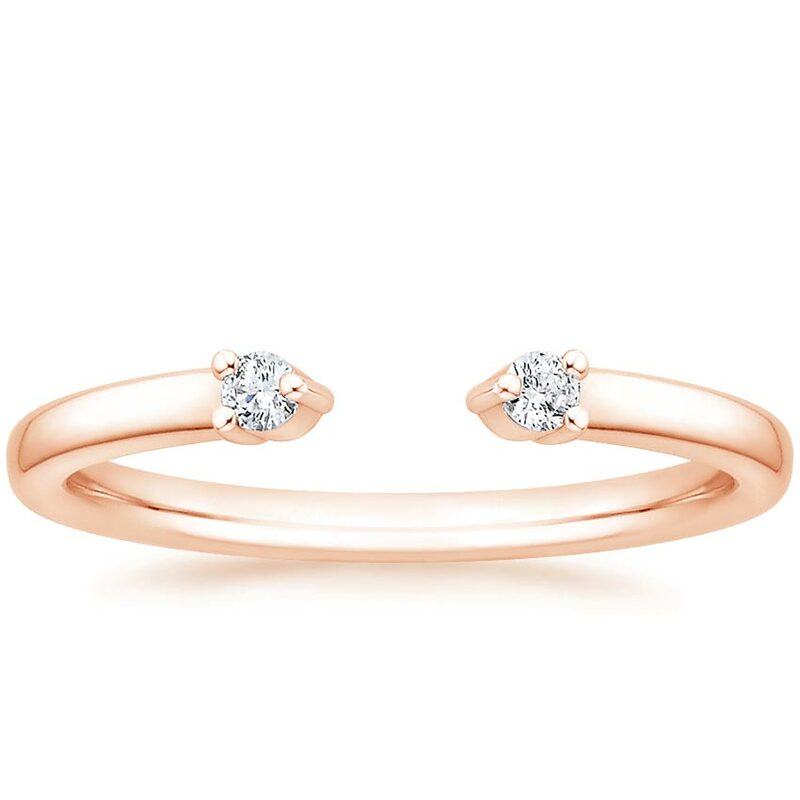 The petite band adds to the sleek, classic look of this ring. Sparkling diamonds adorn this sleek crescent shaped ring which is perfectly styled to complement an engagement ring, stack with other rings, or wear by itself (0.10 total carat weight). Sparkling diamonds adorn this curved wedding band which is perfectly shaped to complement many engagement ring styles (0.10 total carat weight). This exquisite ring features shimmering pavé diamonds that form a chevron-shaped band above the center gemstone. Claw prongs gracefully support the center gem beneath the band, creating an artistic look reminiscent of the Art Nouveau era. 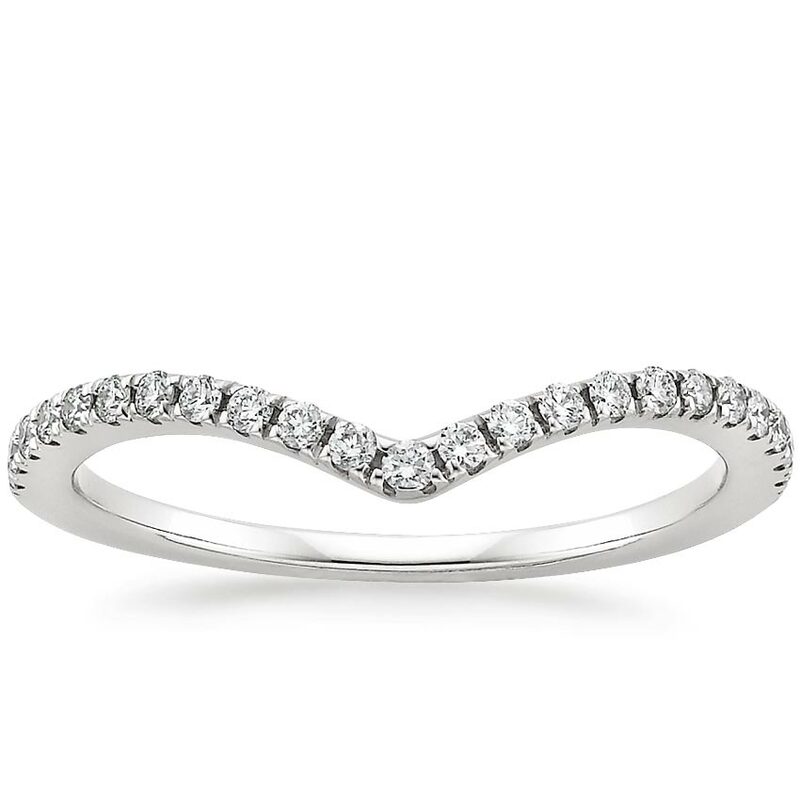 Shimmering scalloped pavé diamonds flow halfway down this band, creating a subtly curved chevron shape. 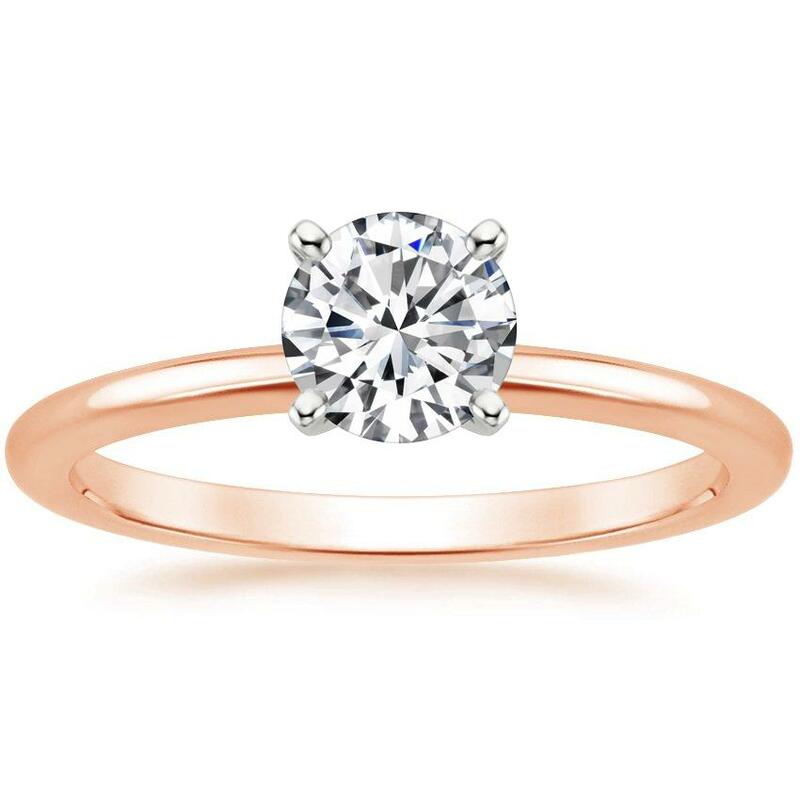 This stylish ring is perfect on its own or paired with an engagement ring (0.20 total carat weight). When it comes to creating an eye-catching ring stack, don’t be afraid to mix your metal types! 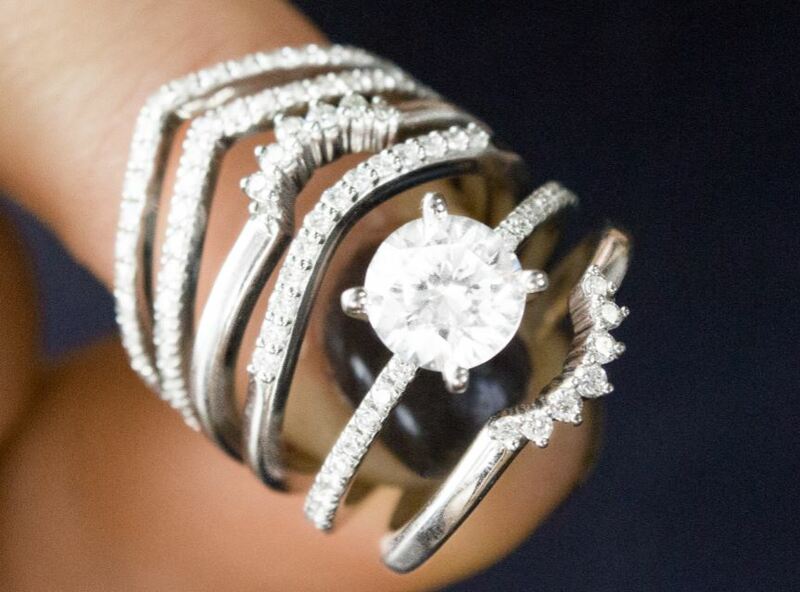 Look to rings that share another common design element, such as milgrain detailing or diamond accents. 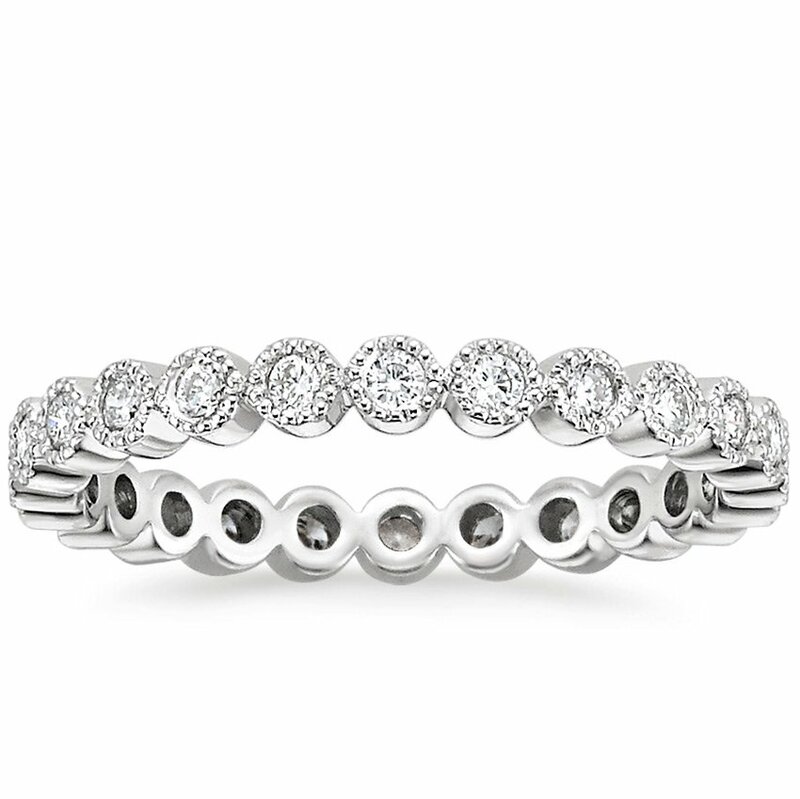 Bezel-set diamonds encircle the finger in this glamorous and whimsical band. Milgrain detailing adds a delicate and lively glimmer. 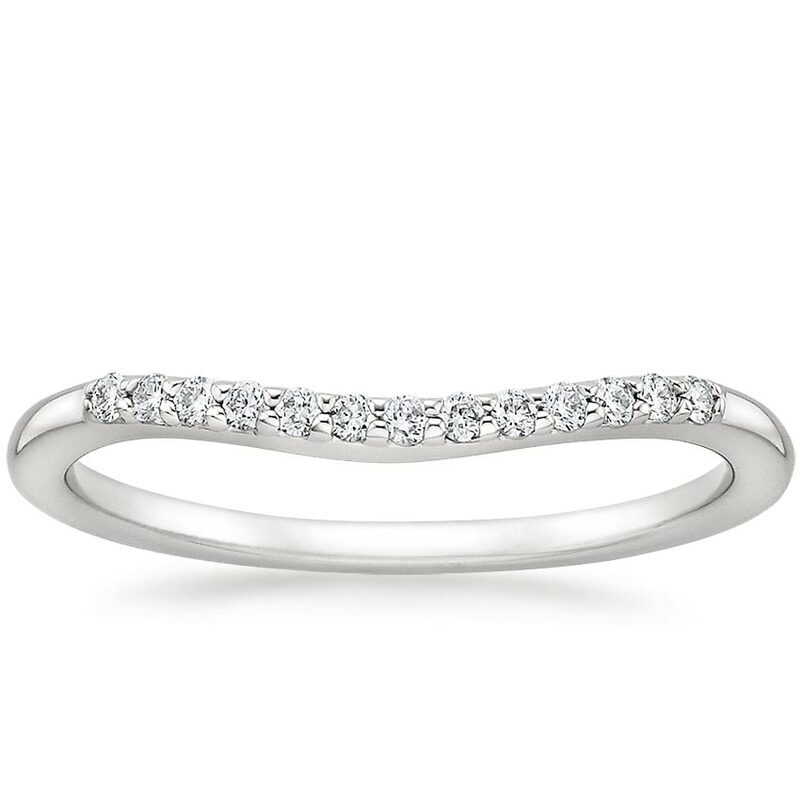 A wonderful choice as a wedding band, it is also the perfect band to stack or wear on its own. Harmonious diamond-accented round and marquise shapes encircle the finger for a delicate wedding band with style. 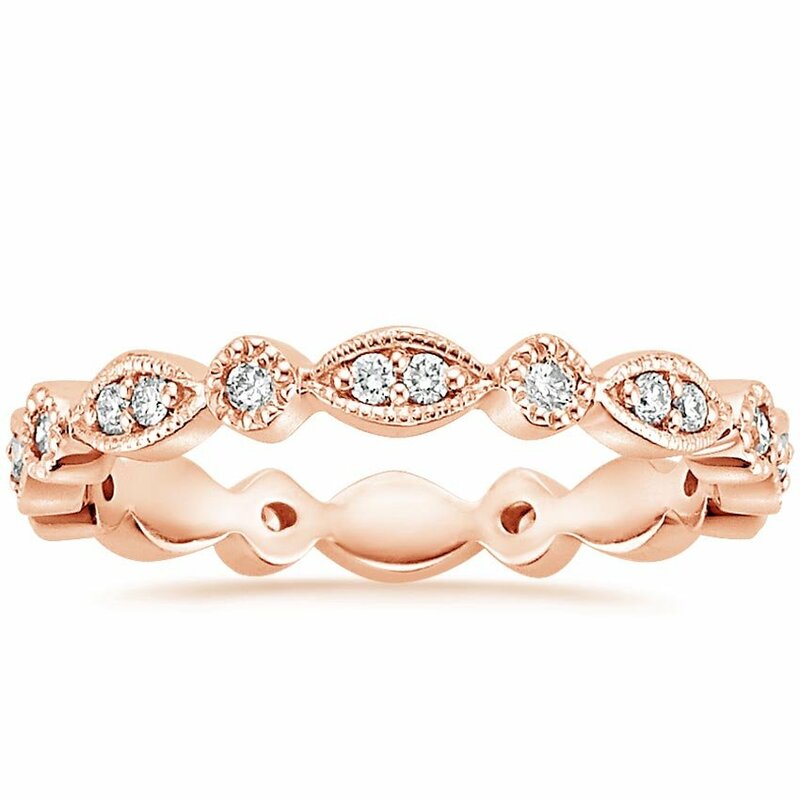 This band is the perfect choice to stack or wear on its own. Encircling the finger with a band of light, this exquisite ring features round diamonds set in delicately sculpted shared prongs. Sparkling diamonds adorn this sleek crescent shaped ring which is perfectly styled to complement an engagement ring, stack with other rings, or wear by itself (0.10 total carat weight). Petite and delicate, this classic four-prong setting has a rounded inside edge for increased comfort. Two prong-set diamonds rest at the ends of a smooth metal band, leaving a small opening to perfectly fit many engagement ring styles. If you are new to ring stacking or would rather go for a more understated look, select rings that are already perfect matches! Stack two of the same rings on top of one another, wear the same ring in two or three different metal types, or pair a solitaire band with an accented band of the same design. 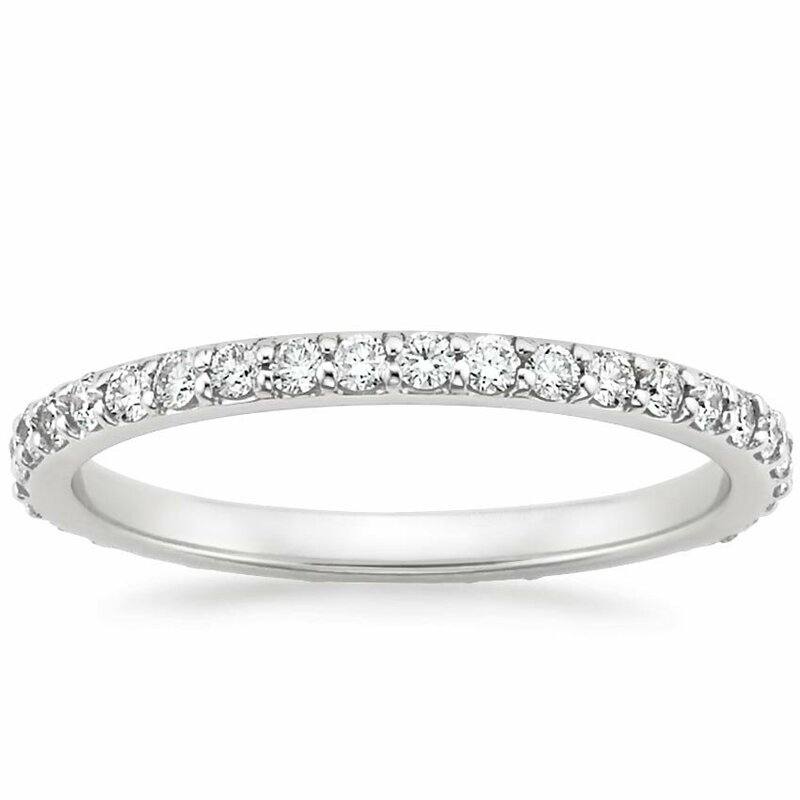 Shimmering scalloped pavé diamonds flow halfway down this band, creating a subtly curved chevron shape. 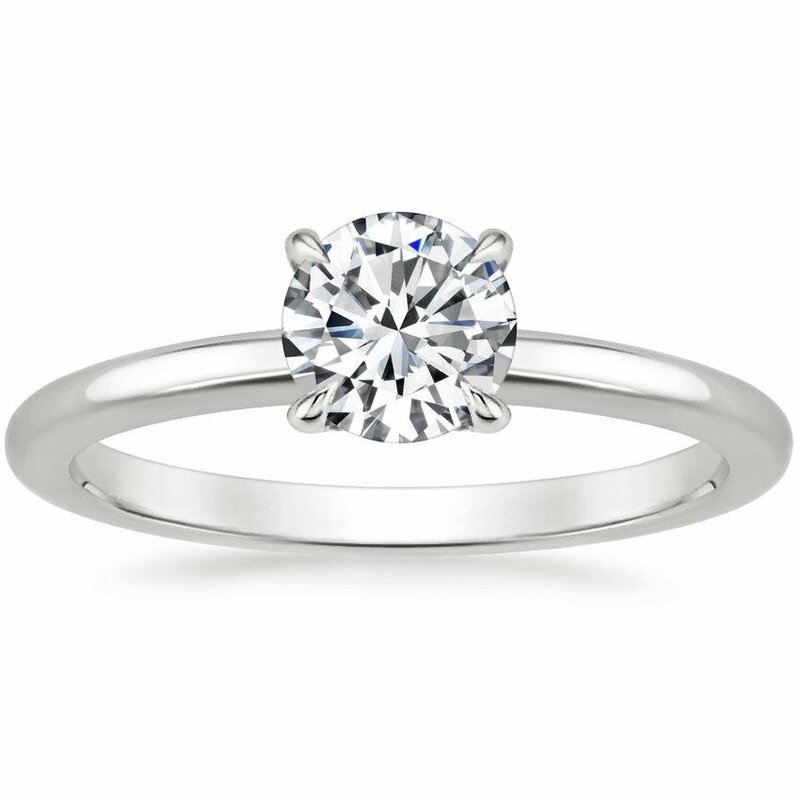 This stylish ring is perfect on its own or paired with an engagement ring (0.20 total carat weight). 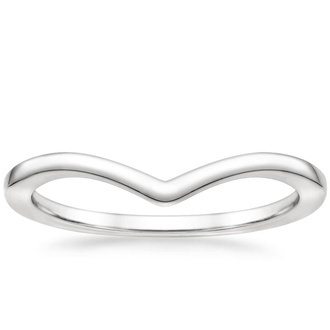 A smooth strand of precious metal cascades down the finger creating a curved chevron shape. 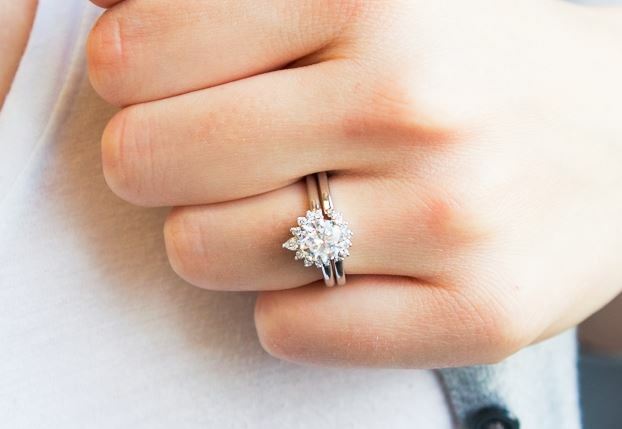 This stylish ring is perfect on its own or paired with an engagement ring. 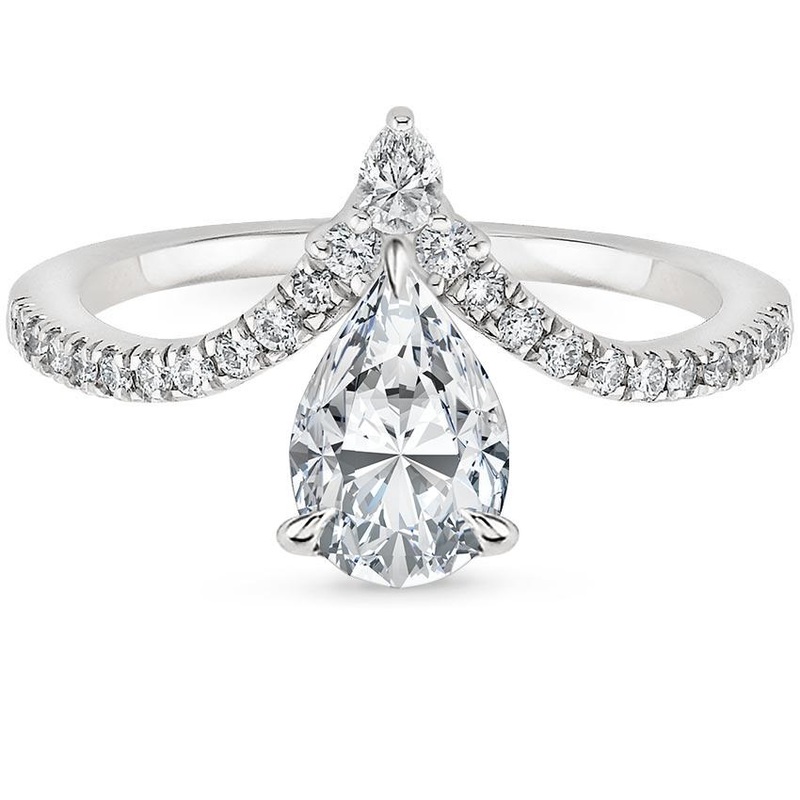 Sparkling pear and round brilliant cut diamonds adorn this modern crescent-shaped engagement ring for an utterly spectacular look (average 0.15 total carat weight). 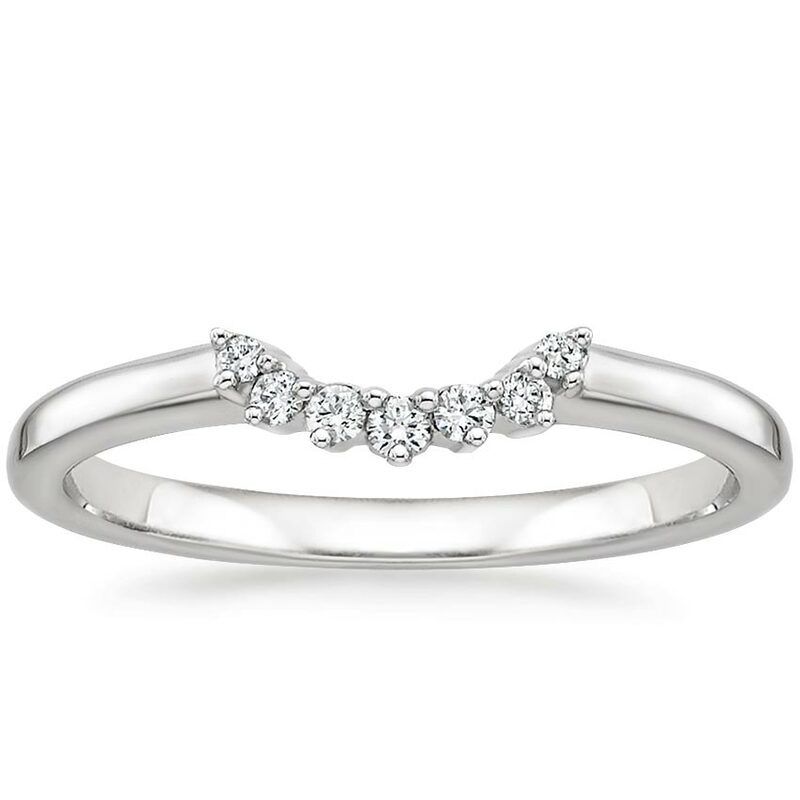 Sparkling diamonds adorn this sleek crescent shaped ring which is perfectly styled to complement an engagement ring, stack with other rings, or wear by itself (0.10 total carat weight). A scintillating halo of baguette and round brilliant diamonds surrounds a glittering center gem in this spectacularly graceful engagement ring (average 0.60 total carat weight).